Writing is a communication skill that says volumes. It is often open to more interpretation than the spoken word and it has the potential to live on the page long after the life of a writer ends. A key to writing that transcends time is that it knows a large audience in a resonant way. Remember that writing skills develop with practice and one way to hone your skills and make a lasting contribution to your relationships is to write letters. (Modern translations might render this emails.) You might consider some of the famous letters that are wonderful contributions to literature. Many of you will immediately reflect on Paul's letters to the New Testament Churches. Take time to read one or two of Paul's letters and ponder how well Paul knows his audiences. Readers recognize skilled writers for a keen awareness of the reader and what the audience will bring to the text. Amazingly, Paul's writing speaks centuries later and throughout many generations. His writing works across cultures and builds the faith of people with various beliefs and many different interpretations. Those are marksof a great writer! Start a correspondence with someone you love and write to him or her at least once a month. Write a letter to God every week. This could be a Sunday activity for 10 - 15 minutes. Pick one event from your life each month for one year. Each month, write about that event to a specific person. For instance, the first week you might write to your significant other, the second week a parent or elderly relative, the third week a child you know and the fourth week a friend. Pay close attention to how the story changes for the audience. The more different the people are that you write to, the better this helps you re-write the story. Experiment with stories that evoke different emotions. Write some that are funny, some that are sad, or write about things past vs. present. (You can even write fiction or science fiction. The goal is to practice writing to the audience.) Keep these printed in a binder and take a look at them every 3 - 6 months. 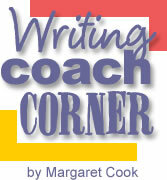 You will see how your writing skills are improving. Some of those stories might also turn into articles for the Next-Step-of-Faith Newsletter. Copyright © July 10, 2006 – Margaret Cook. All rights reserved.